I love my job and do it responsibly! 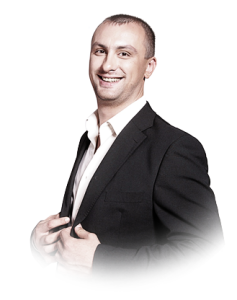 Nikolay Bentsler is a cheerful, creative, and responsible young host with a great sense of humour. My creative mind and ability to quickly understand the audience allows me to respond to any situation during the celebration in a quick and polite manner. No vulgar wedding or anniversary celebration contests. I offer the best possible new contests. I strongly believe that the main rule of organising celebrations is not simply being a host, but also being aware of all the problems and situations that must remain unknown to the customer. My responsibility is to solve any problem occurring during the celebration in such a way that the customer is able to continue to relax and enjoy the evening. Indeed, I will deal with unforeseen situations!